Don’t Waste America–No False Solutions to Nuclear Waste! Our country is facing a nuclear waste crisis. Over 70,000 metric tons of the most lethal waste ever created is piling up at nuclear power plants all over the United States. After over 75 years of making this lethally radioactive waste, there are still no viable nuclear waste solutions that will help protect humans and the environment from the dangers it will pose for a million years or more. Unfortunately, Congressional leaders and the Trump administration are taking steps that will only make the situation worse. They want to put nuclear waste on our roads, rails, and waterways, just to dump it in places where it can never be stored safely. We need real nuclear waste solutions! NIRS is ramping up our Don’t Waste America campaign now to stop them. If we don’t start mobilizing now, communities throughout the U.S. will be at risk of radiation exposure and catastrophic accidents, from tens of thousands of radioactive shipments. False solutions to real problems will only make the nuclear waste crisis more dangerous. OR the seismically and volcanically active Yucca Mountain on Native American land in Nevada. Yucca Mountain is exactly the kind of place where nuclear waste should never be stored. It is doomed to leak and contaminate the environment, and possibly worse. Supposedly temporary “parking lot dumps” would easily become de facto nuclear junkyards, never to move again once the waste has been sent there. Each nuclear waste shipment would contain more long-lived radioactivity than was released by the Hiroshima atomic bomb. Nuclear waste shipments emit radiation constantly, exposing anyone nearby, like roving X-Ray machines that can’t be turned off. An accident or attack on a nuclear waste shipment could release large amounts of radiation, causing cancer and costing billions of dollars in damages and cleanup. The risk of accidents and attacks is even greater because of the massive weight of nuclear waste containers. Truck casks weigh 25 tons. A fully-loaded railway cask weighs 125 tons or more – many of which will need to be transported on roads or barges to reach a rail line. Our road and rail infrastructure can’t easily handle thousands of shipments like this without risking derailments, bridge collapses, and traffic accidents. 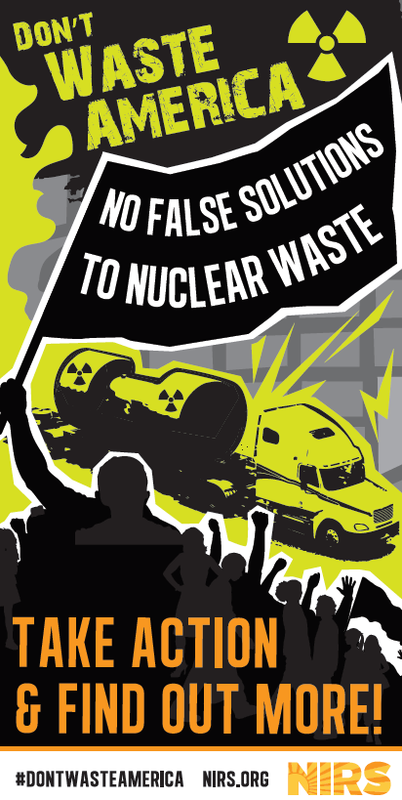 Don’t Waste America is alerting, informing, and activating people throughout the country to the dangers of nuclear waste and the risks of transporting it through their states and communities. NIRS is working with local groups and activists to draw attention to waste shipment routes and demand action from elected officials. We are planning educational events, organizing protests, challenging dump sites, and connecting grassroots activists to information, experts, and strategies they can use. And we are all demanding real solutions to the nuclear waste crisis: protections for communities where nuclear waste is stored now – such as hardened on-site storage – and a scientifically-credible, socially just, consent-based process for deciding the safest long-term isolation method. Phasing out nuclear power is the only way to limit the scale of the nuclear waste problem, for which we still have no long-term solution. But first and foremost, we have to stop Congress from passing bad legislation – either this year or next year. Our goal is to deliver 100,000 petitions to Congress this year and make sure every candidate running for office knows how dangerous mass shipping of nuclear waste would be. To get nuclear waste on track in the U.S. will be a long haul – but we have to act now, or the actions Congress and the Trump administration are taking could permanently derail it, with tragic consequences. Please join our Don’t Waste America Campaign!